Clematis is a genus of about 300 species within the buttercup family Ranunculaceae. 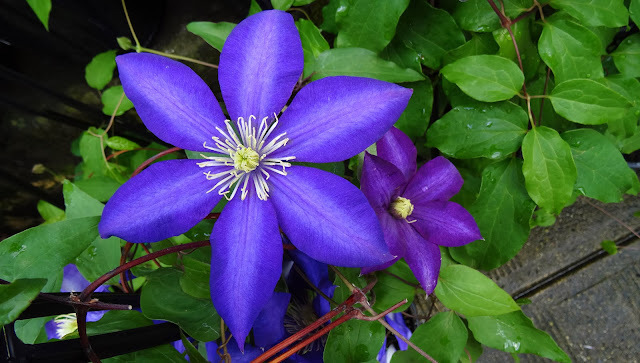 Their garden hybrids have been popular among gardeners, beginning with Clematis × jackmanii, a garden standby since 1862; more hybrid cultivars are being produced constantly. They are mainly of Chinese and Japanese origin. Most species are known as clematis in English, while some are also known as traveller's joy, a name invented for the sole British native, C. vitalba, by the herbalist John Gerard; virgin's bower for C. viticella; old man's beard, applied to several with prominent seedheads; and leather flower or vase vine for the North American Clematis viorna. Illustrated here is the splendid hybrid Clematis 'Daniel Deronda'. Introduced in 1882, 'Daniel Deronda' still holds its own among modern varieties and has given the Royal Horticultural Society's prestigious Award of Garden Merit (AGM) in recognition of its outstanding excellence. It produces purple-blue flowers throughout the summer. These are semi-double early in the season and then single later on. The blooms are followed by eye-catching seed-heads which have a twist at the top. To prune, remove any dead or weak stems in late winter or early spring and cut remaining stems back to the highest pair of strong-growing buds. To encourage blooms to cover the whole plant, train the stems so that they are evenly spaced on their support. As new growth appears in mid-spring, train this to fill any gaps. Plant in a sheltered position that is not north-facing. Petunia is genus of 35 species of flowering plants in the family Solanaceae, of South American origin, closely related to tobacco, cape gooseberries, tomatoes, deadly nightshades, potatoes and chili peppers. The popular flower of the same name derived its epithet from the French, which took the word petun, meaning "tobacco," from a Tupi–Guarani language. 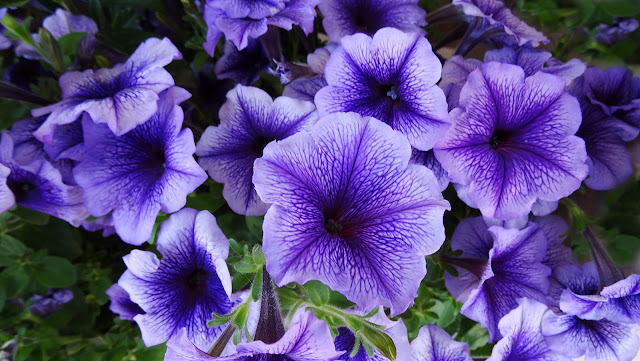 An annual, most of the varieties seen in gardens are hybrids (Petunia × hybrida). Here is one of the Surfinia series of petunia, called 'Purple Vein'. It is perfect for creating colourful summer displays in containers and hanging baskets. It is also a good ground cover plant, making a carpet of lavender blooms with contrasting veins. For the best displays, feed and water regularly. The king protea (Protea cynaroides) is a flowering plant. It is a distinctive member of Protea, having the largest flower head in the genus. The species is also known as giant protea, honeypot or king sugar bush. It is widely distributed in the southwestern and southern parts of South Africa in the fynbos region.The king protea is the national flower of South Africa. It also is the flagship of the The Protea Atlas Project, run by the South African National Botanical Institute. 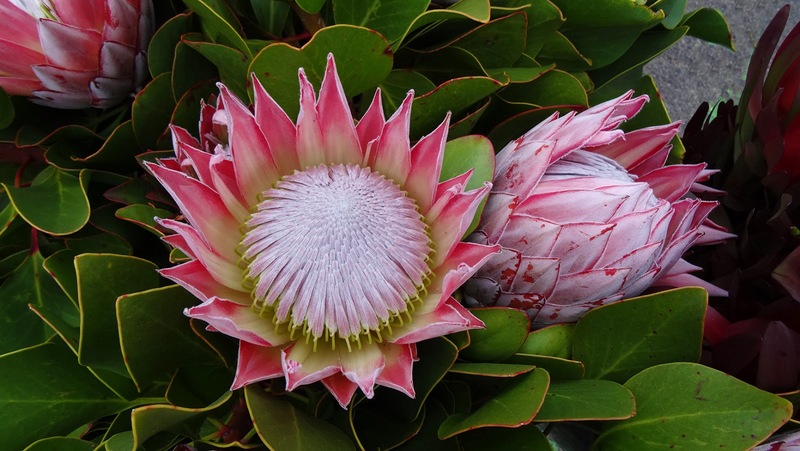 The king protea has several colour forms and horticulturists have recognised 81 garden varieties, some of which have injudiciously been planted in its natural range. In some varieties the pink of the flower and red borders of leaves are replaced by a creamy yellow. This unusual flower has a long vase life in flower arrangements, and makes for an excellent dried flower. Protea cynaroides is adapted to survive wildfires by its thick underground stem, which contains many dormant buds; these will produce the new growth after the fire. 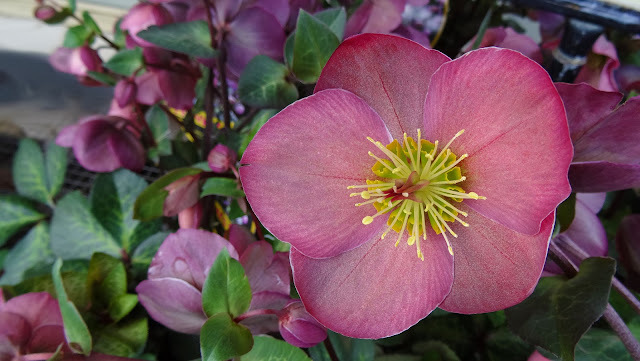 Commonly known as hellebores, members of the genus Helleborus comprise approximately 20 species of herbaceous or evergreen perennial flowering plants in the family Ranunculaceae, within which it gave its name to the tribe of Helleboreae. Many species are poisonous. Despite names such as "Christmas rose" and "Lenten rose", hellebores are not closely related to the rose family (Rosaceae). The flowers have five "petals" (actually sepals) surrounding a ring of small, cup-like nectaries (petals modified to hold nectar). The sepals do not fall as petals would, but remain on the plant, sometimes for many months. Recent research in Spain suggests that the persistence of the sepals contributes to the development of the seeds.